Howard profiles as the likely leader of a backfield committee in Philadelphia, NJ.com's Mike Kay reports. 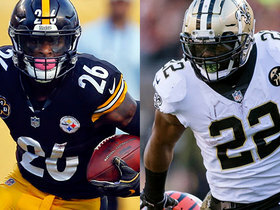 Analysis: The Bears had a crowded backfield with Howard, Tarik Cohen and free-agent pickup Mike Davis, making Howard expendable. Howard saw career lows in rushes, rushing yards and catches in 2018 and could see an uptick in usage now that he's with Philadelphia. Entering his age-24 season, Howard is the favorite to handle early down work for the Eagles, but he could get some competition from the upcoming draft. 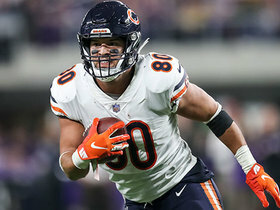 Coach Matt Nagy said Howard still has a role in the Bears offense, despite the offseason addition of Mike Davis, Rich Campbell of the Chicago Tribune reports. Howard may be left without a role after the Bears signed Mike Davis to join Tarik Cohen in their backfield last week, Brad Biggs of the Chicago Tribune reports. Jason La Canfora of CBS Sports reports the Bears are seeking a trade for Howard. Howard rushed 10 times for 35 yards in the Bears' 16-15 playoff loss to the Eagles. 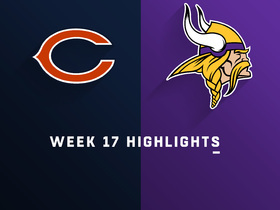 Howard rushed 21 times for 109 yards and two touchdowns and brought in one of two targets for five yards in the Bears' 24-10 win over the Vikings on Sunday. 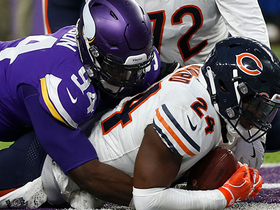 Analysis: Howard surprisingly was able to cross the 100-yard mark against the normally stingy Vikings run defense, with a season-long 42-yard run playing a large part. The third-year back only eclipsed the century mark twice all season, but both instances transpired in the last four games. 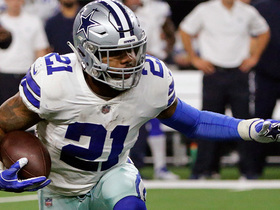 Although the 24-year-old failed to reach 1,000 yards this season for the first time in his career, he'll look to make a postseason impact beginning with a first-round playoff clash versus the Eagles next weekend. 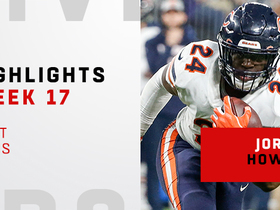 Analysis: Although Chicago played with the lead for much of the second half, the Bears continued to run a balanced offense, keeping Howard from getting additional work. Despite seeing double-digit carries in all but one game this season, he typically needs to find the end zone to be a solid fantasy performer. Although he's scored in each of the last two games, those were the only times he's hit paydirt over the last seven weeks. Howard ran for 101 yards on 19 carries, adding two yards on his lone reception in Sunday's 15-6 win over the Rams. Howard rushed 16 times for 76 yards and brought in his only target for four yards in the Bears' 30-27 overtime loss to the Giants on Sunday. Analysis: While Howard's rushing yardage total was far from spectacular, his 4.8 yards per carry was a welcome sight. The third-year back hadn't been over 4.0 yards per tote since Week 6, a stretch during which he'd been under Sunday's yardage tally in five of six games. 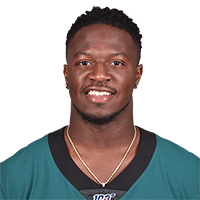 Howard retains an uncontested lead-back role despite his recent struggles and will look to build on Sunday's effort in a Week 14 showdown versus the Rams. Howard rushed seven times for 13 yards and brought in one of two targets for two yards in the Bears' 23-16 win over the Lions on Thursday. Analysis: Howard once again struggled with efficiency on the ground, and he's now failed to average more than 3.7 yards in any of his last six contests. The 24-year-old back is also ceding most passing game work out of the backfield to Tarik Cohen, so his 638 total yards across 11 games have to be considered a disappointment overall. Howard has salvaged things to an extent with five rushing touchdowns, but he'll look to significantly up his contributions against the Giants in a Week 13 battle on Dec. 2. Howard carried the ball 18 times for 63 yards in Sunday's 25-20 win over the Vikings. He caught his lone target for two yards. Howard rushed 11 times for 21 yards and brought in his only target for 11 yards in the Bears' 34-22 win over the Lions on Sunday. 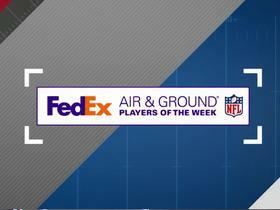 Howard ran for 47 yards and two touchdowns during Sunday's 41-9 win over Buffalo. 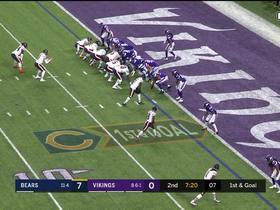 Chicago Bears running back Jordan Howard runs for over 100 yards and two touchdowns in a 24-10 win over the Minnesota Vikings in Week 17 of 2018. 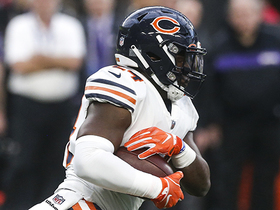 Chicago Bears running back Jordan Howard muscles into the end zone for a 1-yard touchdown. 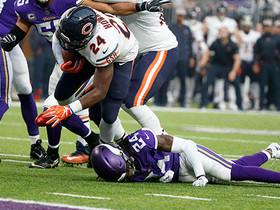 Chicago Bears running back Jordan Howard runs over a defender and gets into the end zone for a 6-yard touchdown.